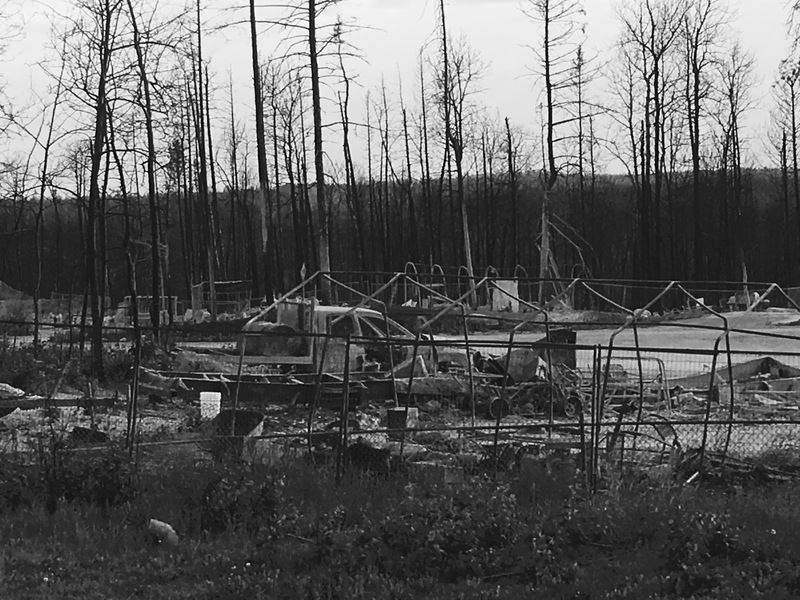 Today is just two days shy of my two month anniversary of leaving Fort McMurray, the morning of the evacuation. I’ve seen photos and posts from friends that have returned, but nothing prepares you for the unexpected wave of emotion to see the scars the fire left behind. I mean we have all seen what the aftermath of a burn looks like. Black. Charred. Partially collapsed buildings and homes reminiscent of a post apocalyptic scene. YMM “My heart overflowith.” Part 1. “My heart overflowith.” Was the caption below one of my friends photos just a couple days after the entire town of Fort McMurray was evacuated due to a raging wildfire consuming much of the community. The past few days have been a torrent of mixed emotions. There have been endless photos and videos of places where I just hung out only days ago, now burnt to the ground. Our town engulfed in flames that one would only imagine happening in apolcayptic movies. 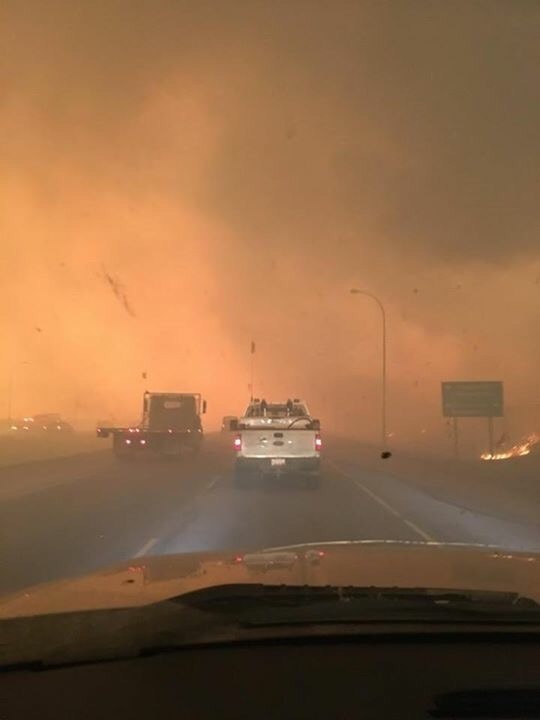 I, myself had only left the morning that morning at 10am, before the single highway leading into Fort McMurray was gridlocked, closed and on fire. This was between 12-2pm on May 3, 2016. By this point I was halfway to Edmonton (the next and pretty much only city, save a couple of gas station villages in between). I normally avoid my phone when driving but my phone was lighting up with messages and images. I had left thinking the fire was under control but suddenly it must have changed, and my chest tightened with anxiety as each post came through. 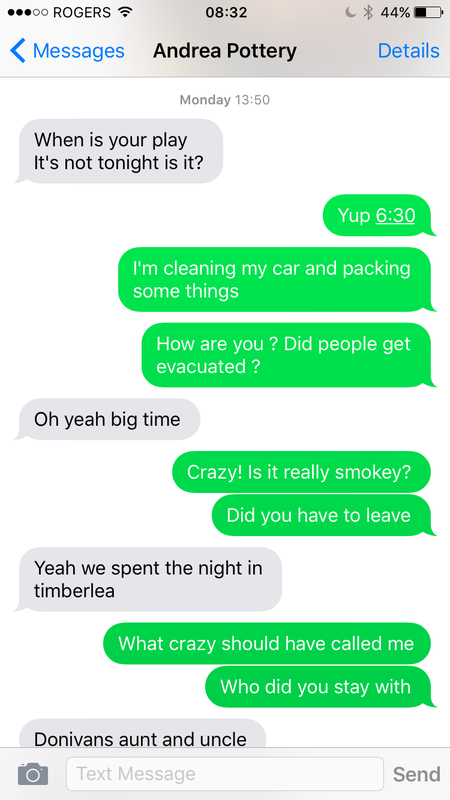 Below is a series of snapshots of a conversation I had with my friend from two days before the major evacuation, leading up to the day after. Two days before the evacuation, we had seen smoke across the highway from her home. Earlier that day she told me her area was on watch for voluntary evacuation. I told her maybe she should pack a go- bag just in case. At that point she wasn’t concerned and invited me to come over. I was in Gregoire having a drink on her patio when we went for a walk to see the smoke. 10 meters beyond her backyard we could see this. I looked at Andrea and I told her. “You need to get ready to leave, if we can see the flames it could change any moment.” If that wind changes, I told her that fire could be at her house in minutes. She saw the seriousness in my face and she knew what I was talking about. Instantly she got on her phone and started calling. I gave her a hug and told her I needed to get my stuff and go home. This was Sunday May 1, 2016. On the way home to Timberlea I could see water bombers in the sky and I parked my car by the river to watch them work. (Video below) The fire at this point was still confined to the forest and to many of us, seemed manageable but still a potential threat to some. By the next morning the smoke in the air was little and the sun was out, the sky was blue. It seemed to many of us that the fire was under control. Andrea had even told me she was allowed to go back home. This was Monday May 2, 2016. The reason why I came back for the weekend was to perform in the Regional One Act Festival and finish moving my stuff from Fort Mcurray to Calgary. This day was as beautiful of a day as any other summer day, I cleaned my car, read my book out in the back yard, and continued to pack the remainder of my things. That evening we had an amazing time performing our one act “Sure Thing.” After watching all the other brilliant performances I went out for drinks with my theatre friends, for what seemed to maybe be the last time in a long time…. And I am selling my Seto Pottery at Paint It Up Pottery studio, in Okotoks, AB, where 50% of my sales will go towards the victims of the YMM Fires. The past few days have been a torrent of mixed emotions. There have been endless photos and videos of places I just hung out only days ago burnt to the ground or engulfed in flames that one would only imagine happened in apolcayptic movies. 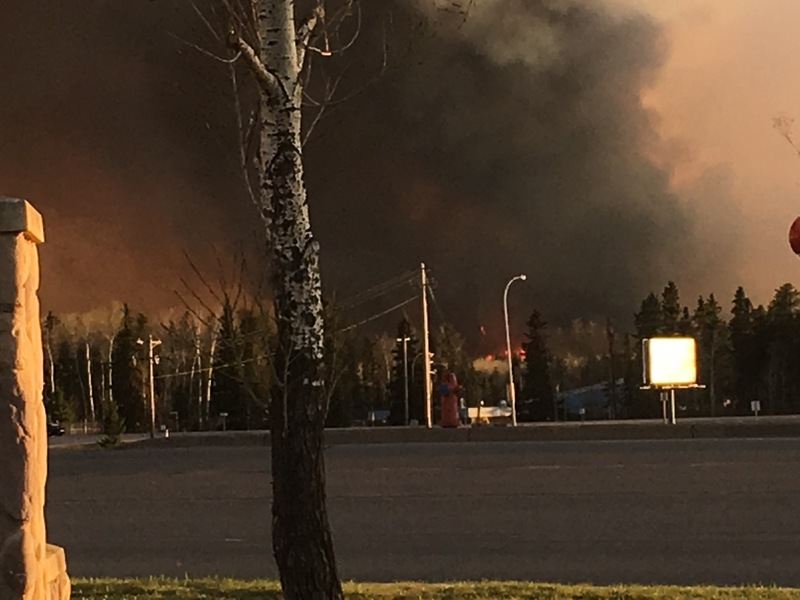 I, myself had only left the morning that morning at 10am, before the single highway leading into Fort McMurray was gridlocked, closed and on fire. This was between 12-2pm on May 3, 2016. By this point I was halfway to Edmonton (the next and pretty much only city, save a couple of gas station villages in between). I normally avoid my phone when driving but my phone was lighting up with messages and images and I had left thinking the fire was under control but suddenly it must have changed. 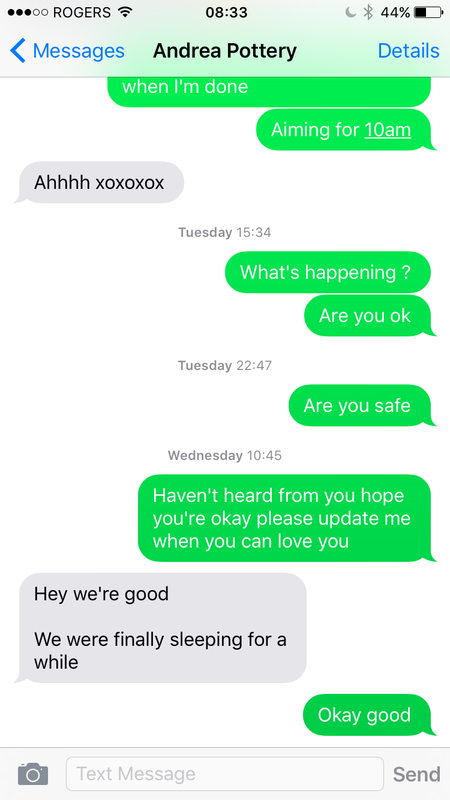 Below is a series of snapshots of a conversation I had with my friend from two days before the major evacuation, to the day after. The day before we had seen smoke across the highway from her home. 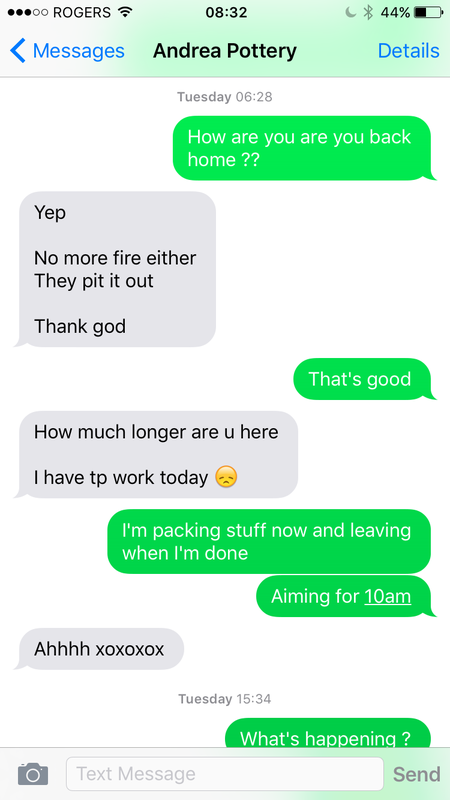 Earlier that day she told me her area was on watch for evacuation. I told her maybe she should pack a go bag just in case. At that point she wasn’t concerned and invited me to come over. I cleaned my car that day, read my book out in the back yard in my swimsuit and packed as much of my stuff into my car. That evening we had amazing time perform out one act “Sure Thing,” and after watching all the other brilliant performances I went out for drinks with my theatre friends for what seemed to maybe be the last time in a long time. The next morning I packed my things, messaged Andrea to see how she was and hit the road by 10 am. Ish. And that brings us back to the beginning of this post… When everything went from being okay to many of my friends losing their homes.